Westminster School → Co-Curricular → Model United Nations → WesMUN 2019 → What is MUN? Model United Nations essentially does what it says on the tin: it models the debates and decision-making of the United Nations. 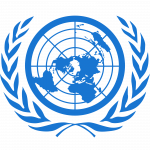 The United Nations is an international organisation that gathers together most (193/196) of the world’s nations to discuss issues of global importance. In the student simulation, students from the same school form a ‘delegation’ of a given nations, comprised of individual ‘delegates’. Much of the debate takes place in committees, each of which deal with a certain theme or group of related issues (disarmament, the environment, human rights etc.). However, many of these committees are part of the broader ‘General Assembly’, where delegations gather at the end of the conference. Here, the work of all the individual committees is brought together for discussion and nations vote on whether to implement the proposed solutions. An essential component of MUN debate is a document called a ‘resolution’. In short, this is a series of written proposals to resolve a given issue. They contain so-called ‘pre-ambulatory clauses’, which lay out the context to the issue, and ‘operative clauses’ which suggest new action to be taken. Resolutions – written by individual delegates or the product of a ‘merger’ of several delegates’ work – form the bulk of MUN debate and are either passed or failed by the committee in question.